Mount Damavand is a superb shaped cone volcano with a narrow snowy peak. It is quite similar to Mount Fuji in Japan but much higher. This staratovolcano is situated about eighty kms driving distance north-east of Tehran, Iran. The white-colored summit of the montain and its wonderful top cloud is the most interesting view of Iran mountains. Damavand is prominent icon of Persia. It has a good position in Iranian legend, mythological stories, art and photography. Several myths and tales are connected to Damawand Iran. But in fact it is just a spectacular dormant volcano which produces some sulphuric fumes. Read more in Damavand Myth. Mount Damavand is situated in a mountainous region, despite the fact that it is surrounded by numerous highs peaks and ridges of the Albroz Mountains, but its superior peak is visible far from numerous kilometers away. In a clear sky and when Damavand Weather is good and the visibility is high enough, it is usually observed from the capital Tehran and far away from in central part of Iran, Karkas Mountains, the great Salt Desert and from the Caspian Sea seacoast. Every year the mountain is visited by numerous sightseers and visitors, mountain tourist, backpack travelers and hikers for Damavand Ski Mountaineering, mountain climbing, hiking & trekking, snowboarding and trekking. Damavand Trekking Season is generally from mid June to mid September for ordinary climbers and mid May to mid October for more experienced mountaineers. The most common starting point is Polour Resort inside the Polur Village at the suothern slope of the mountain. This mountain resort is a shortcut to the Summit as well as a secure spot for accomodation along with acclimatization. Visit also Damavand Weather. In wintertime snow and ice covers the whole mountain. But in spring and autumn months snow remains only on the upper parts, the peak is actually snow-capped few months per year. Among Damavand Glaciers there are a couple of glaciers on the north face of the mountain named Dobi Sel and Sioleh almost with permanent ice and snow. Ice and hardened-snow remain through the year on some other glaciers and spots such as the north east glacier called Yakhar and also the south route Icefall called Damavand Abshar Yakhi. The first ascents to this magnificent volcano is done by anonymous local people who climbed the mountain often to get sulphur for the commercial reasons. In 1837 a Brithish explorer named W Taylor Thomson made the first recorded ascend. Visit also Wikipedia the free encyclopedia. 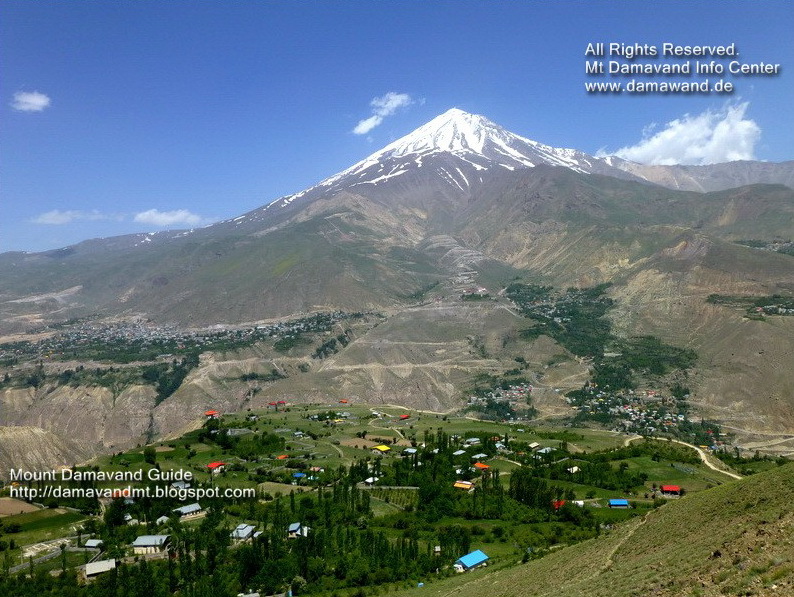 Read more info in Damavand VIP Tour and Damavand Economy Tour. Damavand Volcano is a dormant and its previous eruptions is about 6000 years back. There is no recorded eruption of this volcano within the historic times. Although some people believe this mountain is an extinct volcano, plenty of opposed evidences including Larijan Thermal Springs on the lower slopes and potent fumaroles vent out nearby crater suggests this mountain is dormant and not an extinct volcano. The crater is approx 200 metres from side to side, with lots of yellow-colored rubble containing sulfur as well as pumice stones. Best source of info for hike and trek, climbing and winter climbing and ski touring to Damavand Mountain. Iran mountain guided tour & alpine style mountaineering. Mountain tour organizer with iranian local guides to Alborz and Zagross Ranges. Ski mountaineering and ski touring Tour operator Tehran. Snowboard tour to Iran ski resorts. Tailor made tour for foreign climbers to Alborz & Zagros Mountains. Damavand Iran, Damavand Trek, Damavand Hike. Best services and logistics with qualified teams to support incoming tours to Iran. Sharing experience to give you the best chance of success to the Iran summit. 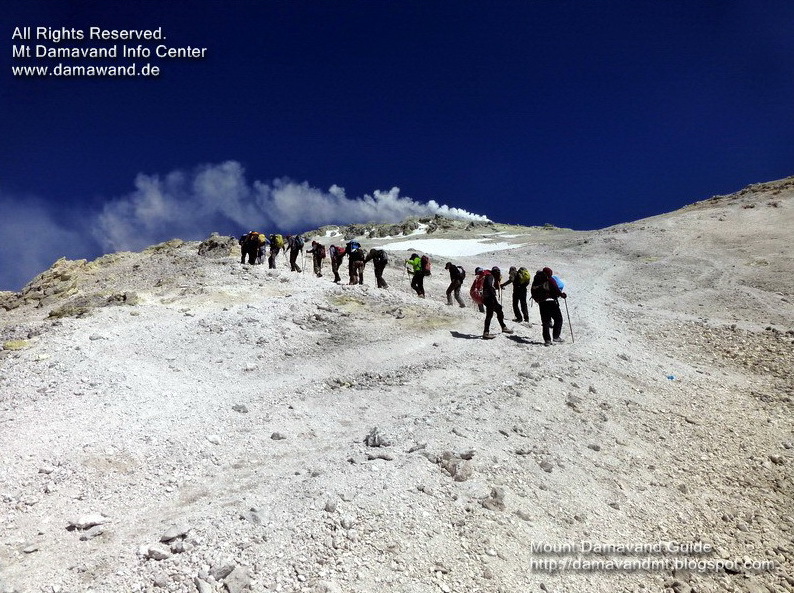 Iran climbing tourism information center for Mt Alam kouh, Mount Dena and Sabalan Volcano. Technical info for safe climbs to the Iran peaks. Comprehensive info for Iran adventure travel and sightseeing tours. Leading outdoor tour organization. Sightseeing and outdoor activity tours Persia. Travel guide Iran. Desert trekking tours. Iran adventure travel tour.